"But the greatest discovery of the evening was Katja Starke. She mastered the highly dramatic role with sweeping passion." Westfalen-Blatt the magazine Westfalen-Blatt wrote on Katja Starkes debut as EBOLI in Don Carlo at the Bielefeld Theatre at the beginning of the season 16/17. Previously, sthe artist had already succeeded at this very theatre as ZIA PRINCIPESSA in Suor Angelica. Katja Starke studied singing at the Würzburg Conservatory of Music with prof. H. Günter, in Zurich, with E. Coelho in Vienna, with H. Raymond in Geneva and with Nicola Martinucci. Sie was a scholarship holder of the Richard-Wagner-Association and of the Opera Zurich. Master classes took her to Brigitte Fassbaender, Thomas Hampson, Elisabeth Schwarzopf, Charlotte Lehmann and Laszlo Polgar. After graduating, she first was a member of the International Opera Studio of the Zurich Opera, where she could be seen as ANNINA in La Traviata, DONNA FULVIA in La Pietra del Paragone, ALISA in Lucia di Lammermmoor, FLORENCE PIKE in Albert Herring, GIOVANNA in Rigoletto and NINETTA in I Vespri Siciliani. From 2004 to 2013 Katja Starke was a member of the St. Gallen Theatre ensemble. Here, she sang a broad range of roles ,including ADALGISA in Bellinis Norma, DONNA ELVIRA in Mozarts Don Giovanni, DORABELLA, in Cosi fan tutte, the 3rd DAME in Die Zauberflöte, Frau REICH in DieLustige Weiber von Windsor, the COMPOSER in Ariadne auf Naxos, HÄNSEL in Hänsel und Gretel, LOLA in Cavalleria Rusticana, OLGA in Eugen Onegin, ORLOVSKY in Die Fledermaus, POLLINA in Pique Dame, SONJETKA in Lady Macbeth of Mzensk, ULRICA in Un ballo in mascara and CARMEN in George Bizets opera. In 2007 she sang Tisbe in Rossinis La Cenerantola together with Cecilia Bartoli in a New Years gala Concert at the Zurich Opera House. In 2005 Katja made a concert tour through Italy with the Orchestra Filarmonica Arturo Toscanini under the musical direction of Yuri Temirkanov, singing the part for mezzo soprano in Mozarts Requiem. Recently, guest engagements brought her once again to the Zurich Opera House as Suzuki in Madama Butterfly,as the COMPOSER in Ariadne auf Naxos to the St. Gallen Theatre , as ERDA in Das Rheingold and Siegfried and as KABANICHA in Katja Kabanova to the Opera de Dijon and to the Hannover State Opera as ULRICA in Un ballo in maschera. In the season 2017/18 Katja Starke sings KABANICHA in Katja Kabanova at the Aachen Theatre, EBOLI in Don Carlo at the Munster Teheatre and the 3rd DAME in Die Zauberflöte at the Bielefeld Theatre. She sings the alto part in Mahlers 2nd SYMPHONYwith the Aachen Symphony Orchestra. Katja Starke as the shirt-sleeved wicked witch was ste star of the evening, particularly for the little ones. 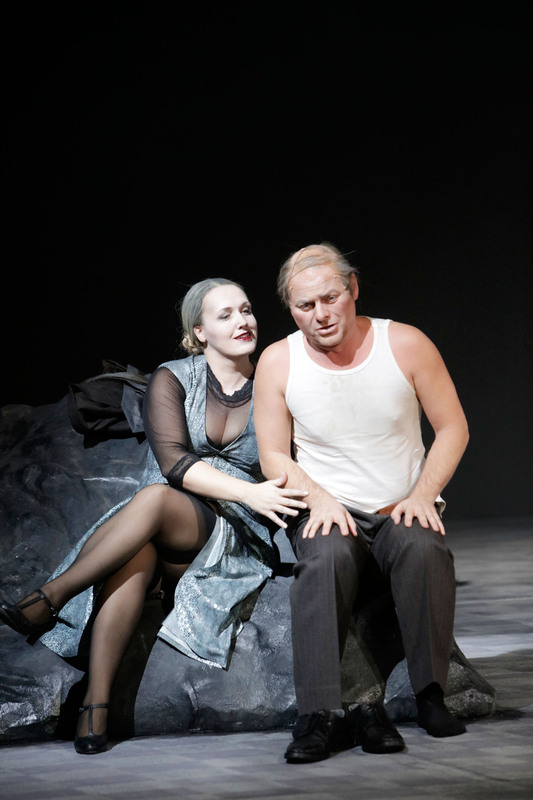 The mezzo soprano Katja Starke, another guest singer in the house, could already be heard as Kabanicha in Janácek’s »Katja Kabanowa«. Her part of the dying abbess is one of the dramatic highlights of the evening. Singing with a by no means old voice Katja Starke impressively performs the dying abbess. With her oraganlike voice KATJA STARKE gives an oppressive portrayal of the old abbess’ suffering. 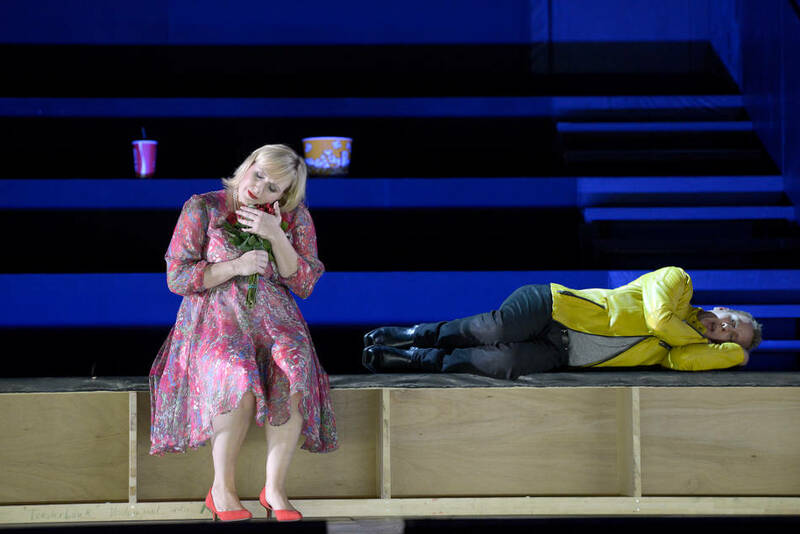 With pastose alto tones the primordial mother Erda, Katja Starke, urged Wotan to avoid the ring but without success. Short but all the more impressive was Katja Starke's performance as Erda..
...and Katja Starke s Marfa is simply overwhelming in vocal expression and intense play. Really outstanding here is the fabulous alto singer Katja Starke, who portrays the Kabachina with enchanting body language and fascinating tones. As Katja Starke as Eboli has a voluminous middle register. In her aria "O don fatale" she convinces with huge dramatic outbursts in the high registers.